The Dome D201 (also known as DAB201) was released in late 2015 by the well-known Chinese electronics manufacturer, Shenzen Dome Technology. It is one of the first dash cams to use the new Ambarella A12A55 processor, allowing it to record at 2560×1440@30fps (1440p) resolution. Lower resolutions are also supported, including 1296p@30fps, 1080p@30fps, 1080p@60fps, and 720p@30 and 60fps. High Dynamic Range (HDR) for improved night vision is available for 1440p@30 and 1080p@30fps. At 1440p, this camera records really impressive video. In terms of clarity, it outperforms most other dash cams we’ve reviewed so far. Colors are bright and vivid, although possibly a bit oversaturated. All surrounding details are clearly visible, and license plates of cars driving by — even at high speeds — are always easily readable by pausing the video. Day time video is excellent, and at night, video quality is also very good. Another great feature of this camera is that it supports SD cards up to 512GB in size. This means that at top quality (recording at the camera’s maximum bit rate of 19 Mbps), you can record almost 60 hours of video before the camera will start to overwrite the oldest files. Of course, there’s a lock file button to mark video sequences that you’d like to keep — these will be placed in an extra folder. Like all dash cams, the Dome D201 supports loop recording, auto on/off, and date/time stamps on video. It has a G-sensor and supports an optional external GPS module. 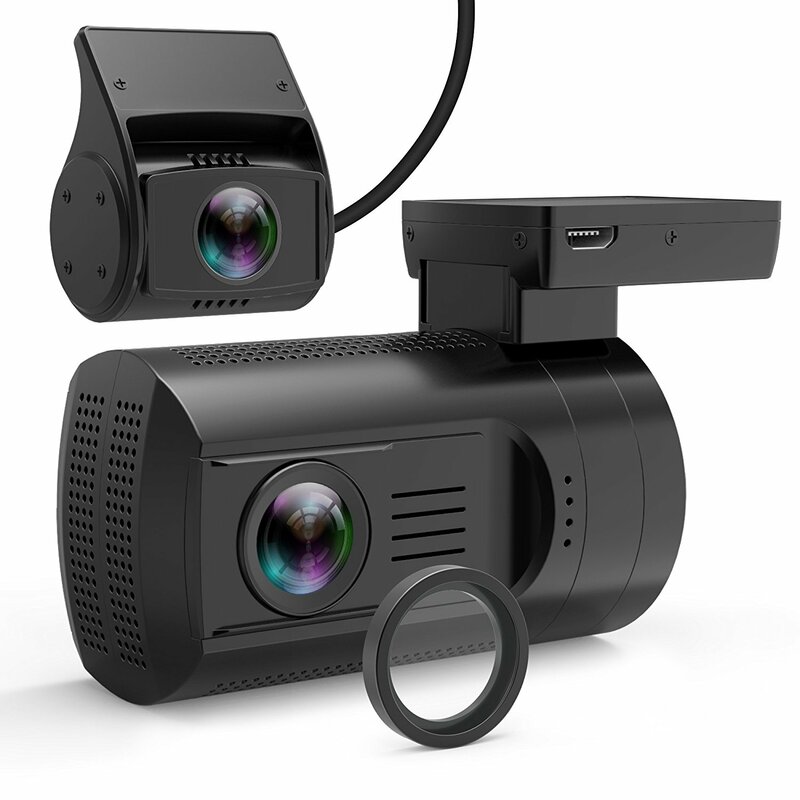 If you order the GPS version of this camera, you’ll receive a GPS dongle that plugs into the top of the camera, to be installed elsewhere in your car. A downside of this camera is its form factor, and while it isn’t particularly large, it’s not particulary discreet, either. This is mainly due to the silver grills on the camera’s front and the large silver ring around the lens. Also, the camera’s suction mount is of mediocre quality — it may be worth getting an extra tape mount to make the camera less prone to vibration. Tape mounts also have the added benefit of being smaller. If this camera were a bit more stealthy, it would probably be one of our favorites for 2016. If you’re happy with the D201’s form factor though, its excellent video quality and high resolution, combined with its huge recording capacity, make this device one of the top picks in the medium price range. Day time video quality is excellent. Colors are bright and vivid. All details are clearly visible, including foliage of trees nearby. Even if you might not need to see foliage in detail, it does show what a difference the 1440p resolution of this camera makes. Of course, license plates of other cars and motorbikes are easily and clearly readable (pause video to read those driving by at high speed). Night video quality is very good. This camera has an impressive low light sensitivity and records colorful video even in dimly lit situations. No washed out license plates like with many other dash cams. Other cars’ license plates are readable even from a distance.